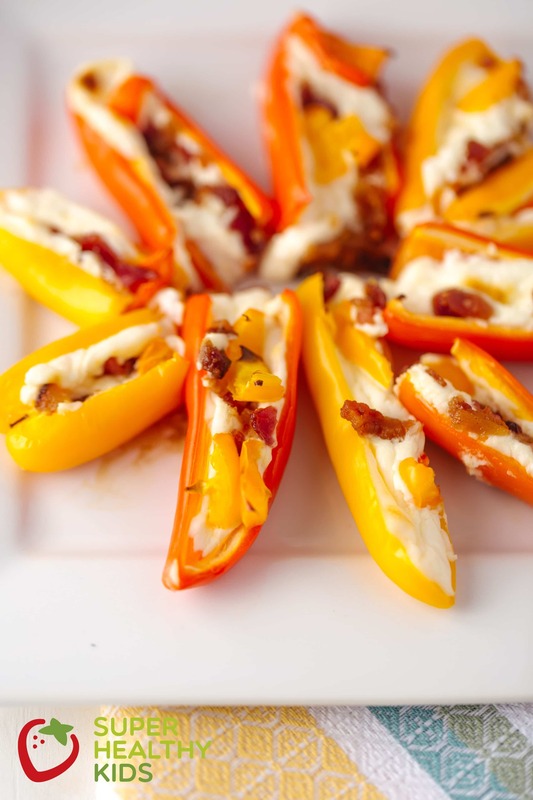 This less spicy pepper popper appetizer is perfect for a game day appetizer for kids who don’t like the heat! Around our house we love spicy food. For my husband, the spicier the better! But our kids are an entirely different story. They ask a lot before trying a new food if it is spicy. 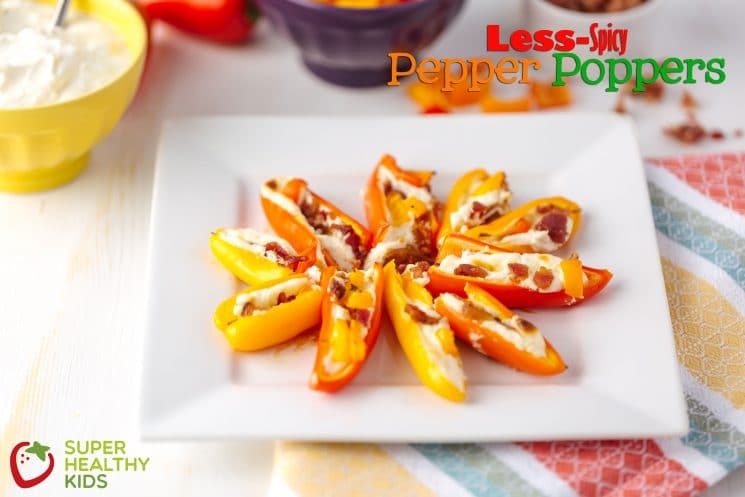 These Less Spicy Pepper Poppers are perfect for little mouths who want to join in the fun of eating ‘grown-up’ appetizers or snacks without the tongue flaming side effects of a Jalapeno Popper. We also love this yummy pepper snack! 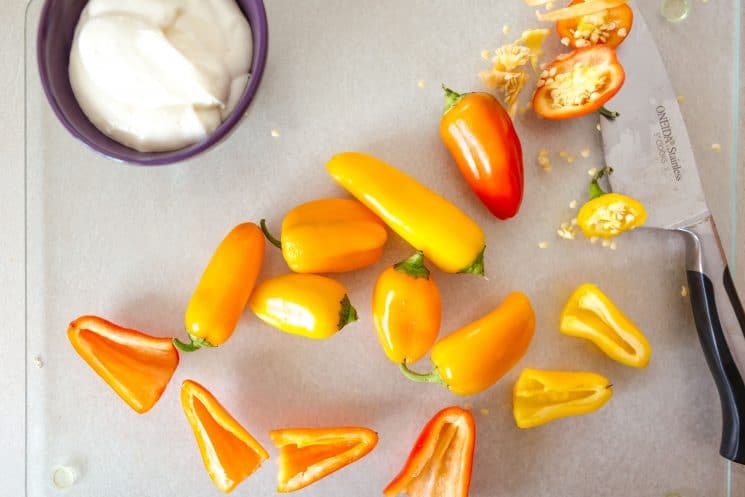 To begin, you will need sweet mini bell peppers in assorted colors. You can buy this in a big bag at Costco which is perfect if you are making these as an appetizer for a crowd. Cut your peppers in half and remove the seeds. After I cut my pepper, I use a spoon to quickly remove the seeds. Since these are not spicy peppers, you can even use your thumb. Next, combine plain yogurt and cream cheese for a creamy filling. Make sure your cream cheese is at room temperature so that you get a smooth mixture. Last, crumble bacon on top and cut additional green and red pepper for garnish. 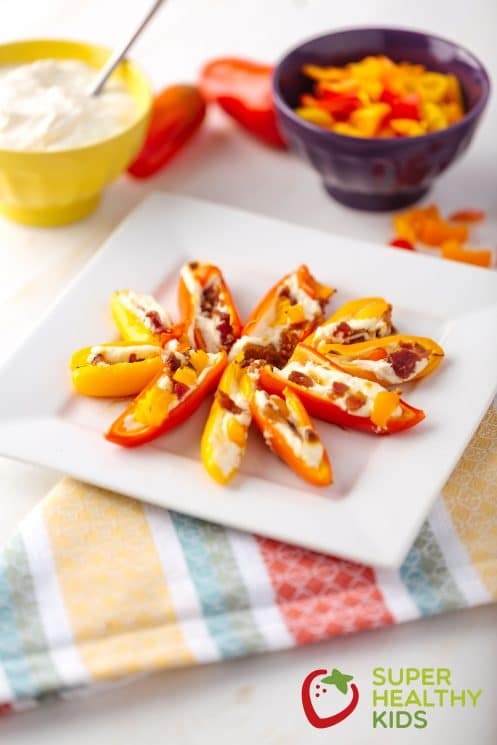 Not only are these a fun colorful appetizer, but they are a great way to introduce peppers to your kids. Because they are baked, they soften and some of the sweetness of the pepper is brought out through cooking. 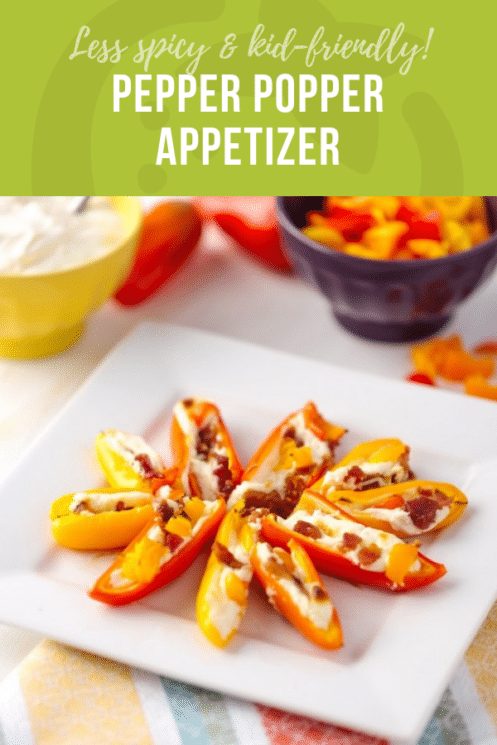 The creamy filling, and crunchy salty bacon make these a delicious appetizer or snack for your kids and for anyone who likes more mild foods. Slice bell peppers and remove seeds. Mix together cream cheese and yogurt. 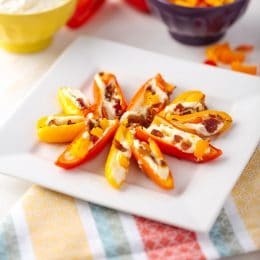 Fill peppers with cheese/yogurt mixture. Sprinkle bacon on top of peppers. Bake at 375 degrees F for 12-15 minutes. Oh my gosh, I can’t wait to try these! What a great idea– thanks for sharing! I am a great grand mother and I have diabetes, and your recipes are some I can work with. Thank you.